The profile is a group of authorization and access rights to the data. Each user is linked to a profile to define the data he can see and possibly manage. In the next screens, the name of profiles is displayed in columns. Access rights and options are displayed in rows. 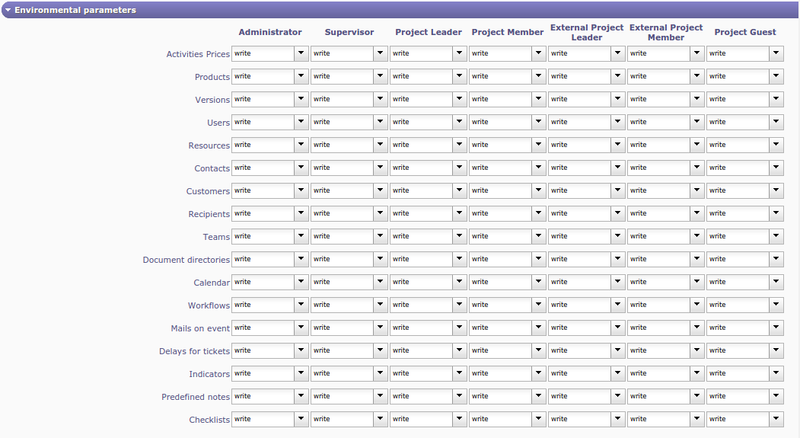 This display format allows to manage easily authorizations for each profile. The value of field “Name” is not the name displayed, but it is a code in the translation table. The name displayed at right of the field is the translated name. The value of field “Name” must be a significant name and must not contain spaces or special characters. Ideally, the value of the field should start with “profile” (to be easily identified in the translation table). Id Unique Id for the profile. Name Name of the profile. Profile code A code that may be internally used when generating emails and alerts. Closed Flag to indicate that profile is archived. Description Complete description of the profile. PL: will designate project leader. The access mode defines a combination of rights to read, created, update or delete items. No element: No element is visible and updatable. Own elements: Only the elements created by the user. Elements he is responsible for: Only the elements the user is responsible for. Elements of own project: Only the elements of the projects the user/resource is allocated to. All elements on all projects: All elements, whatever the project. Ideally, the value of the field should start with “accessProfile” (to be easily identified in the translation table). Id Unique Id for the access mode. Name Name of the access mode. Create rights Scope of possibility to create items. Update rights Scope of updatable items. Delete rights Scope of deletable items. Closed Flag to indicate that access mode is archived. Description Complete description of the access mode. This screen allows to define screen access for each profile. Users belonging to a profile can see the corresponding screen in the menu. Screens are grouped as seen in the menu. Click on checkbox to permit or revoke access to the screen for a profile. This screen allows to define report access for each profile. Users belonging to a profile can see the corresponding report in the report list. Reports are grouped by report categories. Click on checkbox to permit or revoke access to the report for a profile. This screen allows to set element access mode for each profile. Allows to define scope of visibility and updating of data in elements for users and resources. This screen is only for the elements reliant on a project. For each element, selected the access mode granted to a profile. This screen allows to set for each profile, elements access rights. Allows to grant access rights (read only or write) to users, to data on specific elements. This screen is only for the elements not reliant on a project. For each element, select the access rights granted to a profile. This screen groups specific functionalities options. Users belonging to a profile can have access to the application specific functions. Depending on options of functionality, allows to grant access rights, to define data visibility or to enable or disable option. For each option, select the access granted to a profile. Defines who will be able to see and update “real work” for other users. Defines who can validate weekly work for resource. Defines who have access on diary for resources. In most cases, it is devoted to project leader. This section defines for each profile the scope of visibility of work and cost data. This section defines the visibility and the possibility to edit assignments (on activities or else). This section defines whether some button will be displayed or not. This option defines for each profile whether the button will be displayed or not, facing every combo list box. Through this button, it is possible to select an item and create a new item. This button may also be hidden depending on access rights (if the user has no read access to corresponding elements). Defines visibility or not to the checklist (if defined). This section defines access to planning functionality. This option defines for each profile the ability to calculate planning or not. This option defines for each profile the ability to see the resource planning of others. This section defines for each profile the ability to unlock any document or requirement. Otherwise, each user can only unlock the documents and requirements locked by himself. This section defines for each profile the ability to change the resource parameter in reports. Defines for each profile the ability to force delete items. Defines for each profile the ability to update creation information. For profiles and access modes, the value of field “Name” is translatable. The field “Name” in screens Profiles and Access modes is not the name displayed, but it is a code in the translation table. The translated name depends on user language selected in User parameters screen. If translated name is displayed between , then the value of field “Name” is not found in the translation table. In ProjeQtOr, a translation table file is defined for each available language. The files are named “lang.js” and are localized in a directory named with ISO language code. How to modify the translation file? You can edit file “lang.js” to add translation of new value or to modify the existing value translation. Or, you can download Excel file named “lang.xls”, available on ProjeQtOr site. You can modify the translation tables of all languages and produce files “lang.js”.